Your Dinoz will have one of his elemental values increased, at random, by one point. Next, you'll be asked to select from a list of available skills - based on the element in which you advanced. Choose the skill which best fits the desired profile of your Dinoz. You can see the list of skills that your Dinoz has learnt using the Details tab on his page. The race of your Dinoz affects the probabilities of which element your Dinoz can improve. This means that the skills and developmental possibilities vary from Dinoz to Dinoz. 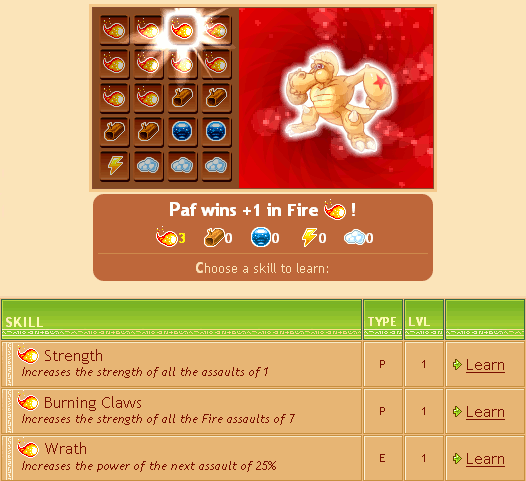 Each skill that your Dinoz learns enables him to access more powerful skills. However, before learning these new skills, you will have to unlock them. These skills can be unlocked by progressing to a high level. You can choose between learning skills that unlock many different skill paths or quickly unlocking the strongest skills.